They say age is just a number. But there is no denying that as we get older, our health declines depending on our lifestyle when we were younger. When I reached 40, I noticed that my metabolism became much slower compared to a decade ago. I also have to eat in moderation because my blood chemistry test results have alarming figures. Dr. Hamid Jan bin Jan Mohamed, an expert in nutrition from Malaysia who is also a member of Herbalife Nutrition Advisory Board is in the country for the 2019 Asia Pacific Wellness Tour Philippines leg. 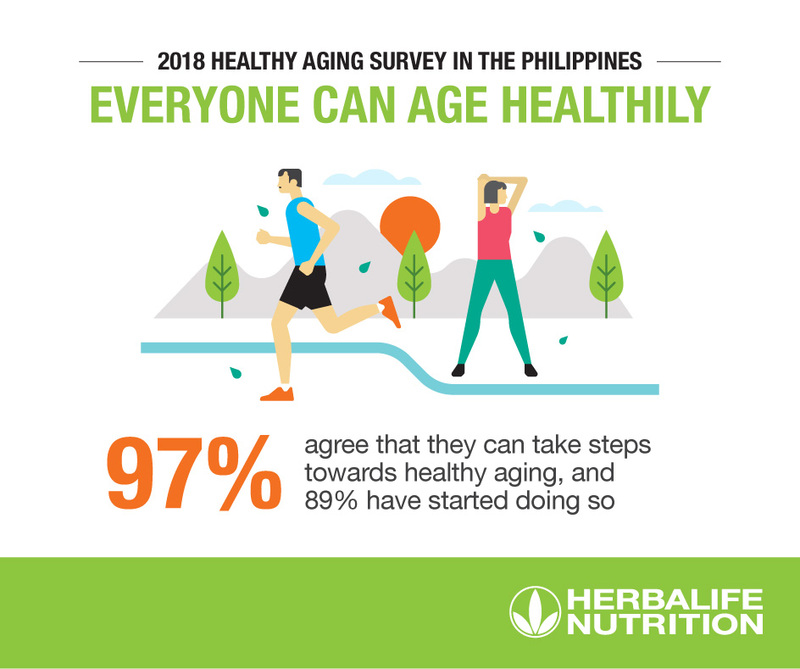 He will be talking about healthy aging before the independent members of Herbalife Nutrition Philippines at the Wellness Tour. "We are delighted to welcome Dr. Hamid Jan to be our guest speaker at this year’s APAC Wellness Tour. 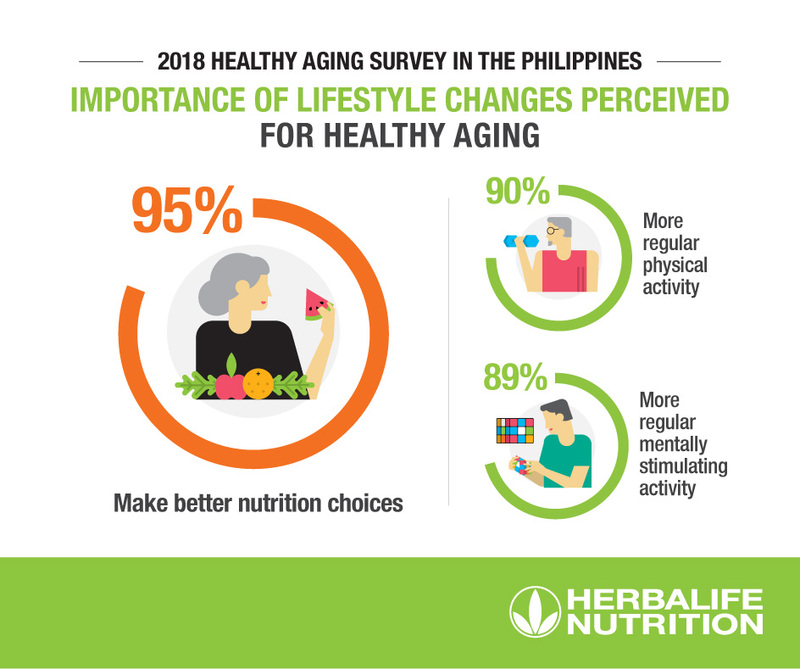 We are looking forward to learning more from him on topics like good nutrition and how it can help in healthy aging,” said Sridhar Rajagopalan, Senior Director and Sub-Region Head for Philippines of Herbalife Nutrition. “While aging is an inevitable process, we believe we can take active steps to age healthily. Through the Wellness Tour, Dr. Hamid Jan will share valuable tips and advice to help people harness the power of nutrition to kick start their healthy aging journey early,” added Mr. Rajagopalan. By 2050, the aging population is expected to increase to 1.3 billion. 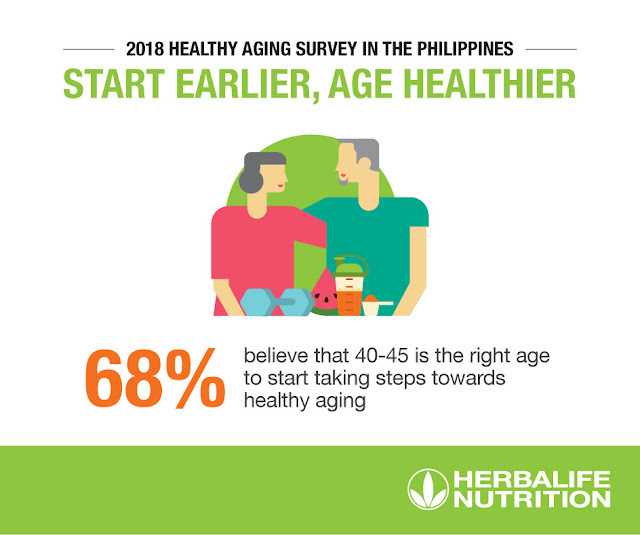 In Herbalife, 50% of the members are above 40 years old. 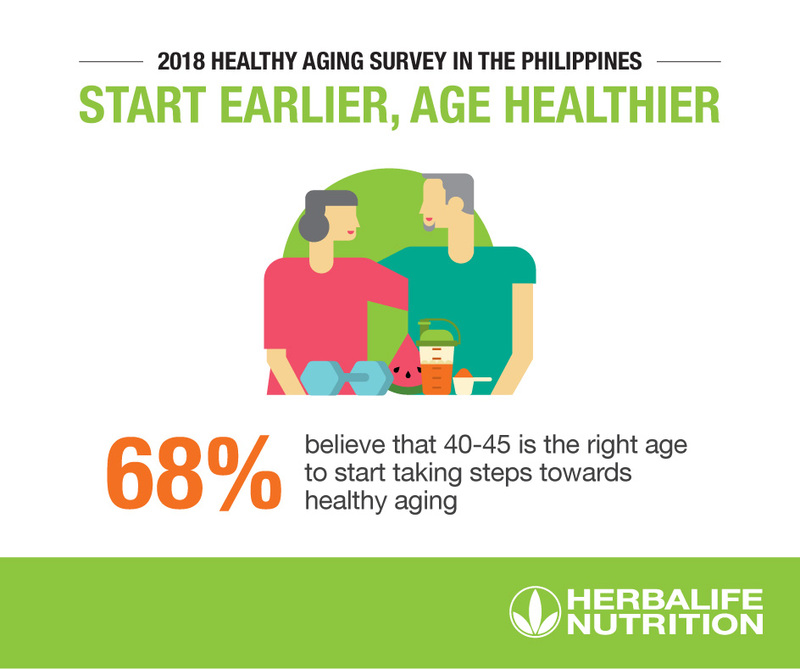 68% of Filipinos believe that 40-45 is the right age to start taking steps towards healthy aging. 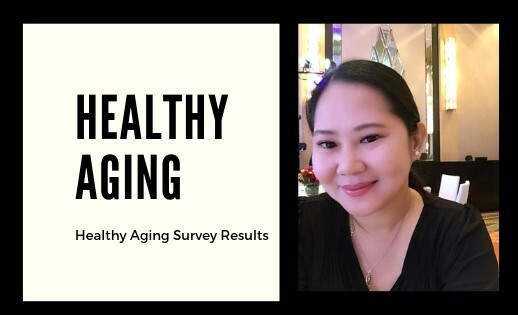 What does healthy aging mean? 78% said that healthy aging means physically active as they age, 76% said it's being mentally active or alert, while 71% said it means not suffering from acute or chronic ailments. For the 67%, having the ability to continue pursuing their personal dreams and goals as they age is an indicator of healthy aging. 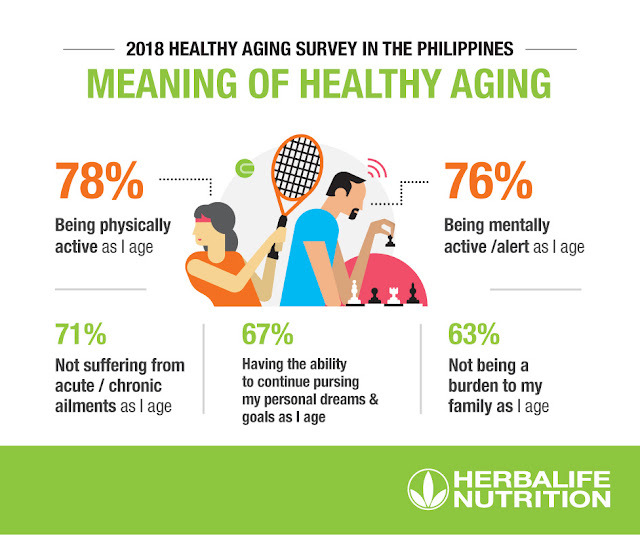 63% believes aging healthy means not being a burden to their family. 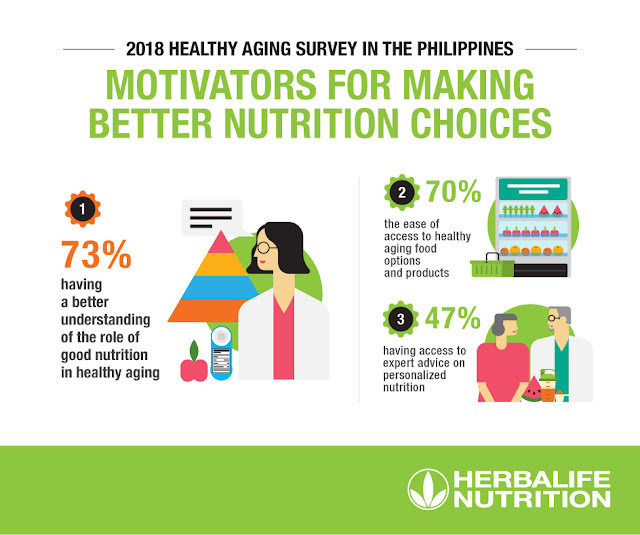 What motivates the Filipinos in making better nutrition choices? 73% have a better understanding of the role of good nutrition in healthy aging and therefore they know what go into their diet. 70% can afford to buy healthy food options and products while 47% have access to expert advice on personalized nutrition. Concerns of most in the aging population are digestive health, heart health, bone health, and eye health. Everyone can age healthily. 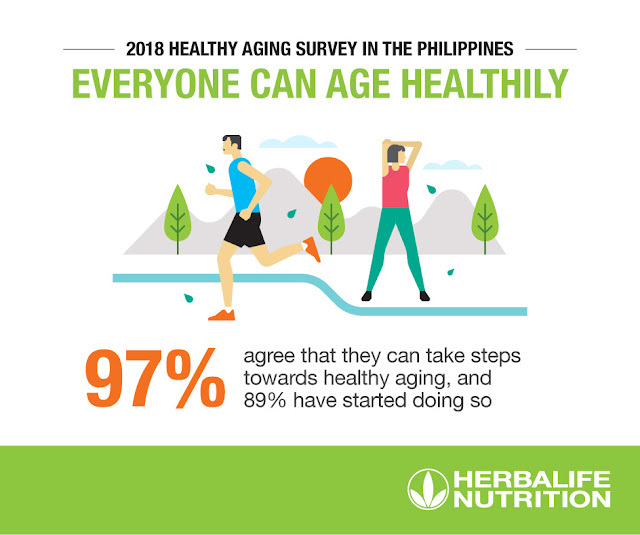 The survey revealed that 97% agreed they can take steps towards healthy aging and 89% have already started living a healthy lifestyle. Herbalife Nutrition's purpose is to make the world healthier and happier. The Herbalife Nutrition Advisory Board (NAB) comprises leading experts from around the world in nutrition, science, and health. The NAB helps educate and train the Company's Independent Members on leading a healthy, active lifestyle and getting proper nutrition.